You are here: Home / FREEbies / Xia-Xia Review & Giveaway!! 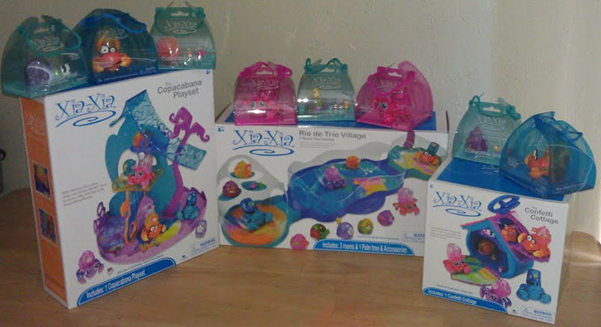 I received the Xia-Xia’s and playsets you see above and was asked to do a review on them and a giveaway! My 7 year old granddaughter was so excited about them she did a great video for us! They are so cute and would make great Christmas gifts!! 1 Xia-Xia & a Xia-Xia shell! Just leave a comment telling me which you think would be your child’s favorite! There will be 1 winner! This giveaway will end Monday, October 31st, 2011 at 11:59 pm Central time and the winner will be announced soon thereafter. If the winner does not respond to my email within 24 hours then another winner will be chosen. Open to U.S. Residents only. Must 18 or over to enter. Winner will be chosen by And The Winner Is… plugin. I think my daughters favorite would be turks. she is a very girly girl and loves “little” play toys. This is already on my “to buy” list, if only I could find them!!! I think my daughter would love Bimini. 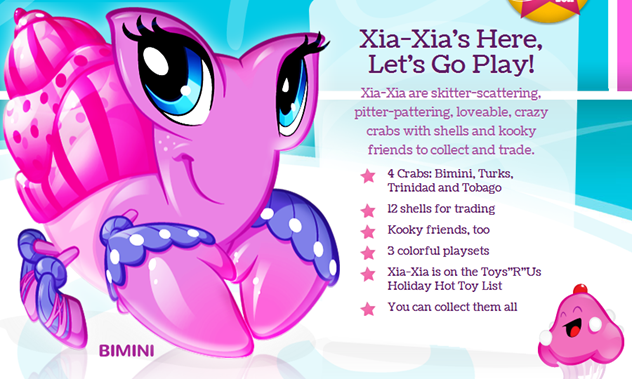 I think my niece woul adore Bimini Crab. She received several of the xia xia for her birthday and was excited. She would like Bimini because she loves everything pink. I think my nieces will like Trinidad and Turks!!! My Daughter loves them all ,but if she had to pick on I believe her favorite is Bimini ! I wish when i was a child we had cute and fun items like this to play with! Thanks for making this fun.. I love your blog! I think my granddaughter would like either Bimini or Turks. My daughter wants Bimini, she has been watching the commercials saying I want this for Christmas. My son who is six would love Trinidad (he loves those kind of things and would love to play with it with his 19 month old sister….hmmm maybe both should get one so they don’t fight over them!) and my little girl would die for Turks! I think my daughter would love Tabago. My son loves Tobago. He had a hermit crab that sadly went to hermit crab heaven. He really wants these little guys. And if they stop working, at least you can replace with batteries :). Great little toys. Good luck everyone! My daughter would love Turks!! I have two daughters that would love to have any of the Xia Xias! I think my little sis would love Turks. My daughter would like Bimini. My daughter would like the Turks! My daughter would love the turks!